If you're a long time reader of Makeup Savvy then you may remember when I shared a face mask dupe for Glamglow Youthmud! I was beyond pleased that I didn't have to fork out £42 for a 50ml jar from Glamglow! So while this feels a bit like Deja Vu I wanted to share yet another dupe I've found, this time for GLAMGLOW Supermud Clearing Treatment, a face mask which my oily blemish-prone skin loves and I know is a huge favourite for many! Now before I get into this post I want to briefly share my opinions on 'dupes', which are essentially copies of more expensive products, both when it comes to skincare and makeup. For me it's simple, if a brand can legally come out with such a similar product and it catches my attention then I see no reason not to buy it. It doesn't take away from those much larger premium brands, they seem to be doing pretty well to me, while allowing consumers on a budget or those that don't want to spend their disposable income on premium products a chance to try out something similar. So yes, I personally love a good dupe! Although I'm aware there are varying views on the subject. Anyway, back to the Glamglow Supmud Face Mask dupe that will save you an amazing £36 and contains quite a lot of crossover ingredients that match the iconic and much-loved mask. The mask dupe I'm talking about is Aldi Specialbuy Lacura Charcoal Clearing Mudmask (£5.99/50ml) - available in-store only, which much like Glamglow Supermud (£42/50ml) boasts mattifying and pore-refining results, making it ideal for oily to combination skin. 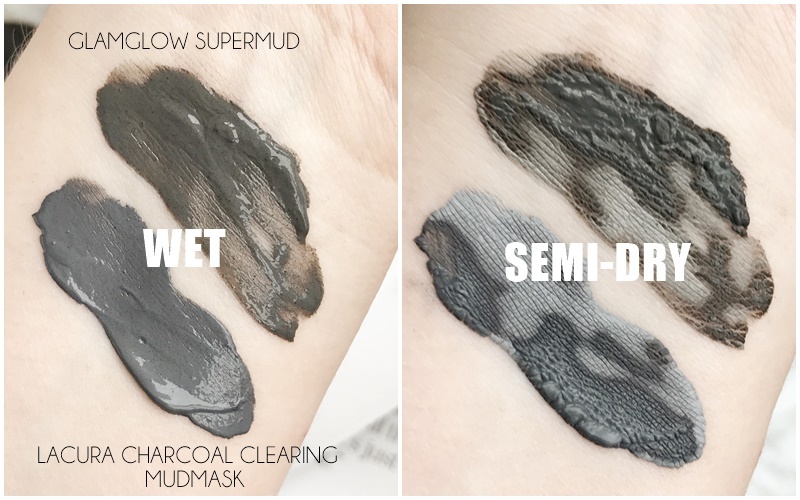 Both the Aldi Lacura Charcoal Clearing Mudmask and Glamglow Supermud Mask are best suited to non-sensitive oily to combination skin, especially those with blemishes. In fact, both masks are ideal to use as overnight spot treatments! If you love Glamglow Supermud mask for how oily absorbing and skin clearing it is or any other clay mask for that matter then I'm sure you will love this cheaper alternative from the Lacura skincare range at Aldi! So why am I classing this as a dupe for Glamglow Supermud? On comparing the two masks I found them to have 16 matching ingredients, the first 3 ingredients being the exact same - Aqua, Kaolin and Magnesium Aluminum Silicate. I also instantly noted how similar both face masks smelt, with a nearly identical eucalyptus and liquorice scent. As for texture and application, both masks apply the same with application using a face mask brush or foundation brush giving the most smooth and even coverage. If anything the budget Lacura Charcoal Clearing Mask is slightly thicker/creamier. Both masks also absorb excess oil from the pores as they start to dry which you can visibly see with both masks drying at the same rate to a stiff feeling. Removal is also exactly the same, using either water on your hands to remove the mask or a warm damp flannel. For such effective clay face masks that do dry down they both are easily removed. As for results... which is the deciding factor after all! I'm happy to confirm there really isn't anything more special or effective with the Glamglow Supermud mask than the Lacura Charcoal Clearing Mask. Both delivering mattified, smooth skin that looks both brighter and clearer with one use. I can also report that the Lacure dupe also works well as a targeted overnight spot treatment really drying up blemishes and helping them to clear up faster. Overall whether you enjoy using a good clay face mask or you're a fan of Glamglow Supermud then the Lacura Charcoal Clearing Mask really is an impressive skin treat - I know I'm really impressed with it. But hurry, Aldi Special buys are never around for long!